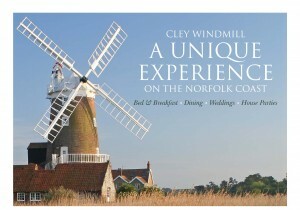 The windmill itself has been converted into a guesthouse of immense character, charm and comfort. The old stables and boathouses are now stylish bedrooms with Dovecote a self catering retreat for independent holidaymakers. 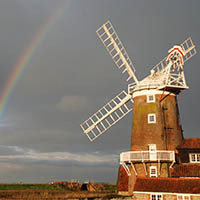 The windmill featured in MGM’s 1949 film ‘Conspirator’ with Elizabeth Taylor and was the scene of various intrigues in the televised Ruth Rendell Mysteries. 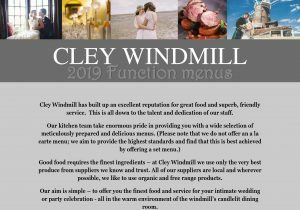 It featured extensively in David Bellamy’s television series and was used for several years, with the sails apparently turning, as the BBC1 continuity link. 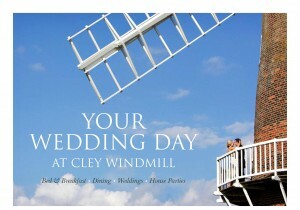 The windmill stands on the north side of the village within walking distance of the excellent and unusual village shops. 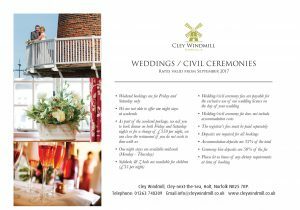 It has uninterrupted views over the sea, the salt marshes and Cley Bird Sanctuary, with Blakeney Harbour in the distance. The large walled garden abuts the river Glaven, surrounded by reeds and tranquility. 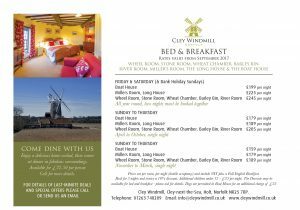 The windmill is a unique building and has one of the highest occupancy rates of any guesthouse in England, achieving 99% in August and averaging 84% for the rest of the year.